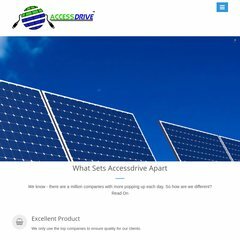 Topics: Accessdrive, Services, Web Development, Computer Repair, and Helpful Sites. It is hosted by Godaddy.com Inc (Arizona, Scottsdale,) using Apache web server. There are 2 Nameservers, ns01.domaincontrol.com, and ns02.domaincontrol.com. Accessdrive.net's IP address is 50.63.212.1. PING (50.63.212.1) 56(84) bytes of data.